Stephen Best is a banana farmer from the island of St Lucia in the Eastern Caribbean. Stephen’s farm is about 7 hectares, 5 of which are used for banana production and 2 for growing vegetables. Stephen is also Chairman of the Windward Islands Farmers Association (WINFA). WINFA was Fairtrade certified in 2000 and has a membership of around 3,500 banana farmers. He is also Vice Chair of the St. Lucia National Fairtrade Organization, and Chair of the Mabouya Valley Fairtrade Group. “My involvement with the umbrella producer organization body, WINFA, entails keeping producers in the Windward Islands constantly aware of the production and marketing problems and measures that should be embarked upon to address those issues so we can maintain market space. It also entails engaging in advocacy and giving pursuit to deepening the collaborative process with local, regional and international organizations in order to create greater awareness of the significance of Fairtrade to small producers” – Stephen. 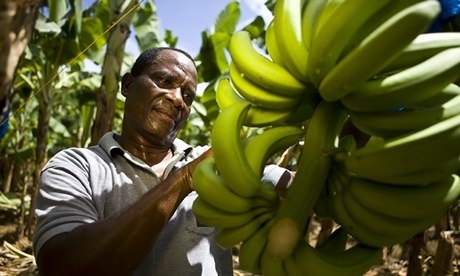 More than 85 per cent of bananas grown in the Windward Islands are Fairtrade certified. Fairtrade Standards ensure farmers receive a price per box of bananas that covers their costs of production. In addition WINFA receives the Fairtrade Premium of $1.00 per box to fund community improvements and business development, including diversification into other agricultural products and income generation schemes. “Prior to the introduction of Fairtrade banana production, I was engaged in conventional banana production which was proving to be non-financially viable for all Windward Island banana producers” – Stephen. Farm improvements to meet GLOBALGAP health and safety standards (required by UK retailers): upgrading packing stations, installing pit toilets and lunch rooms for workers. Agro-tourism: an inter-island income diversification project to refurbish a processing plant to process members’ passion fruit, guava, other fruit into jams, juices and chutneys for sale locally. Health: medical equipment for rural clinics, construction of a medical store, wheelchairs for elderly, annual health checks for workers on members’ farms. Education: pre-school construction and equipment, computers for schools, scholarships for secondary school students, new school bus and bus shelter. Community development: refurbishment of community centres, installing street lighting. Infrastructure: improvement of farm access roads and bridges. Social security: supplementary contributions to farmers’ pension funds. Reduced use of agrichemicals has led to an increase in wildlife (worms, birds, snakes, and crayfish) and allowed animals to be grazed nearby and food crops to be grown. Regular campaigns to remove waste – e.g. the insecticide-impregnated plastic bags used to protect bananas on the trees – have resulted in a cleaner, healthier local environment. Buffer zones between banana plots and rivers/roads have reduced soil erosion, protected fruit from traffic pollution and provided space to plant fruit trees for domestic consumption. Liberalisation of the global banana trade has put the Windward’s banana industry under increasing competition from lower-cost bananas grown on vast plantations in Latin American and West Africa. These bananas are on the frontline of a 10-year supermarket price war in the UK which has resulted in loose bananas today selling for almost 50 per cent less than in 2002, devaluing them in the eyes of shoppers. This continuous downward pressure on prices makes it hard to see how anyone could be making a profit, or where investment in a more sustainable and fair banana industry for the future can come from. Low retail prices mean farmers like Stephen struggle to cover the costs of running small family farms that use more socially and environmentally friendly methods with fewer agrichemicals but have higher overall costs because of the hilly terrain, lower yields and higher transport, quality control, and labour costs. For plantation workers, low retail prices mean long hours, low wages, trade union repression, poor health and safety standards and intensive use of agrichemicals which are harmful to both workers and the environment. Bananas have been crucial to the economic and social development of the Windward Islands for more than 50 years – at one time employing 50 per cent of the workforce and contributing 50 per cent of export earnings. As recently as the 1990s the Windward Islands supplied 60 per cent of the UK’s bananas but liberalization of the global banana trade has almost wiped out the industry. The EU Banana Regime has traditionally given preferential treatment to imports from the Windward Islands and other former European colonies in recognition of the importance of the trade to their economic development. But in 1996 Latin American banana exporting countries and the US lodged the first of a series of legal challenges at the World Trade Organization complaining that the EU regime discriminated against Latin American producers. A new agreement signed in December 2009 resolved the long-running dispute and cemented the process of opening up the EU market to increased imports from Latin America by reducing the duty paid on them.